The perfect in-between of casual and dress -- nicer than a sneaker but more relaxed than a dress shoe -- the desert boot provides a great way for looking smart in the warmer months without suffocating your feet. The perfect in-between of casual and dress — nicer than a sneaker but more relaxed than a dress shoe — the desert boot provides a great way for looking smart without suffocating your feet. The warmer months can be tricky as far as dressing well is concerned. It’s not unreasonable to put comfort before style, but is it really necessary? Not if you’ve got a pair of desert boots. Similar in form to a chukka boot, the desert boot is based off a style British Army officers in World War II fell in love with from the markets of Cairo. If you’re not sure about the look, don’t cast the idea off until you see a pair being worn. The desert boot looks great with jeans and khakis, with a dress shirt or a t-shirt, proving to be one of the most versatile things about spring. Less rugged than a larger boot like my beloved Fryes and less formal than most oxfords, desert boots provide a nice balance of dress and casual. 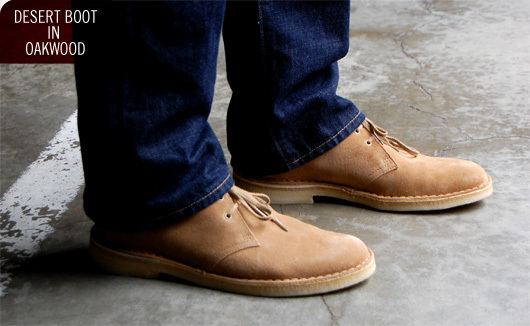 The go-to brand for desert boots is Clarks. 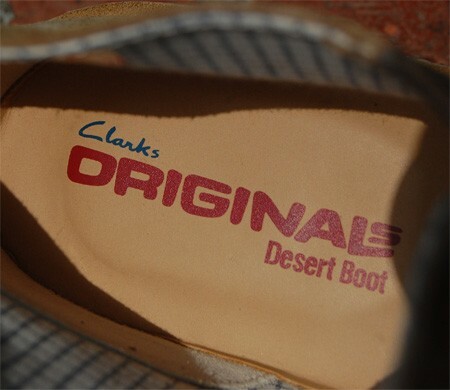 A classic British shoe company founded in the 1800’s, Nathan Clark launched the desert boot in 1950. Several styles exist, but our favorites come in suede. The brown pair shown here are known as Taupe Suede and are the perfect warm month replacement of any brown casual boot or shoe in your winter arsenal. The lighter khaki colored pair shown here are known as Oakwood and are my quintessential desert boot. The tone is perfect for busting out with some colorful chinos. You can see them in action in my article How to Wear a Tucked in Shirt Without Looking Like an Old Man. You’ll want to weatherproof the suede, and make no mistake, these aren’t all-purpose weather boots. Their soft construction and light sole keep your feet cool; if you wear them in the winter, your feet will be cold and may end up wet. The great thing about desert boots is the cost: full price is under $100, and if you’re savvy can find them at places like Nordstrom Rack for $50. The style is not exclusive to the originators, other brands like Urban Outfitters, Ben Sherman, and Lands’ End Canvas offer their takes as well. 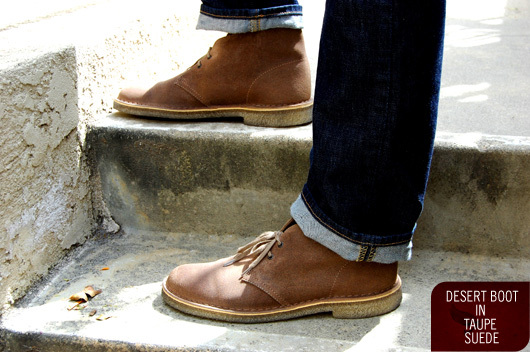 This spring, give Clarks Desert Boots a shot, they’ll quickly become your default for almost every casual situation. We asked Clarks what they recommend for caring for their suede. 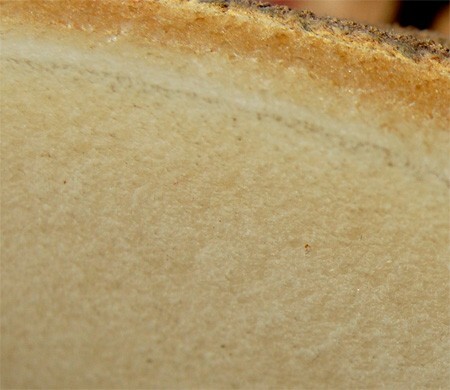 To clean, use a rubber suede eraser to remove dirt and smudges. Then, brush lightly with a soft brush specifically for suede and nubuck products. I’ve been wearing Magnum brand desert boots for two years now. 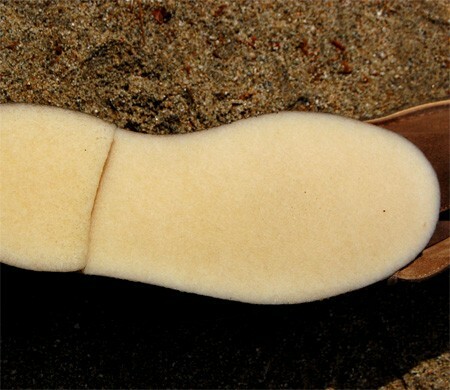 They have sneaker soles with boot uppers. Super comfortable, easy to clean. Comfortable even when the kids drag you around the mall or zoo all day, or you take the family on a long drive. And very durable. The Magnums I wore in the service were still in decent shape 15 years later- too bad I outgrew them. I planning to get a pair of desert boots this year to see me through the warmer months, but was put off by the quite often flimsy construction. I was tempted by Loakes solid equivalent which looks great in dark blue. But I’m thinking of going for a pair of DM chukkas instead. A bit hefty I have to admit, but they’ll last a hell of a lot longer. You’d have to rip my Clarks Desert boots from my cold, dead hands. The best part is how they age. They look much cooler and more versatile as they get a little age on them. This should be a core shoe in your wardrobe. I picked up the Beeswax leather just a few weeks ago. They were kinda stiff at first but the leather has started to break in nicely and the more scuffs they get the better they look. If you are buying the Clarks, make sure to size down. I wear an 11, but in the Clarks I bought a 10.5. Got mine through Club Monaco–20% student discount meant getting them for less than other places. Taupe Suede. Wore them like hell through the winter too, which means there’s some “water damage” on the toe now, but I think they look best worn and broken in. Ended up tossing in an insole though because they definitely are hard on your feet when walking long distances I found–no support, but I wasn’t expecting any. My favourite shoes right now. Joe, The Loakes look great! Playstead, Absolutely agree. Definitely a staple every guy should have. Kevin, I like the Beeswax leather as well. It’ll look great broken in. Ben, Nice find! I be they look great with some wear on them. Hi, I’ve often admired them from afar, never had a pair, will be looking into them more seriously in the near future. Enjoy my sneakers, but never hurts to have variety. I love the look of the beeswax and the taupe. I recently bought the taupe 2 months ago and already the soles are comin unglued???! I walked the soles right off of the beeswax pair I had in only 6 months?! I need a solution here. Has my luck just landed me with faulty boots or do you others have the same issue? I’m all about the broke in look. But I want the shoe to stay together. Be tough an look tough. I don’t think anyone can argue with that? That’s some crazy bad luck you’re having with your shoes. I haven’t had any problems similar to that with the two I have. Maybe someone else can jump in with thoughts? If it’s only been 2 months you should try getting in touch with the manufacturer. I did just that and they are shipping me a new pair. No hassle at all. I’m glad they stand by their product and hope that these boots last! Jacob, that’s fantastic! Glad it worked out, and thanks for checking back to let everyone know. I just came acorss this site today. 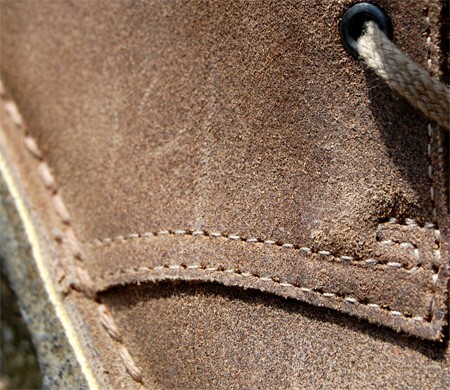 I’ve been looking into purchasing Clark’s desert boots and really love the Oakwood suede look but my only issue is in half the pictures they look a more camel colour and in others they are darker coloured. I really like the camel coloured look in the oakwood suedes. Is it all just tricky lighting and great photography though? I’d say the photo that is the close up of the toe at the bottom of the article is a good representation of its color in real life. Thanks for the speedy reply and clarifaction mate! I love this site, I found it very recently. I was wondering which of the Clarks Desert Boots you would suggest. The Oakwood or the Taupe? I love them both, but I can’t make up my mind. Thanks! Glad you like it! If you already have a pair or two of brown boots you may want to try the oakwood. If not, or are ready for a new pair, go with the taupe, it’s more versatile. What are your thoughts on Clark’s Wallabees? They have a small following on my campus, but I’m not sure about their appeal outside the college bubble. John, I think Wallabees can look great with the right outfit and the right venue. I don’t think they’re super versatile, and don’t really work for professional situations except for occasionally in the casual office. Clarks desert boots are a must! I wear them everywhere- dressed up or casual. Just got back from India and they even survived that trek. They are like fine wine too because they get better as they get older. Every person should have a pair! My most recent purchase of Clark’s Desert Boots has left me feeling completely satisfied and confident in my style. 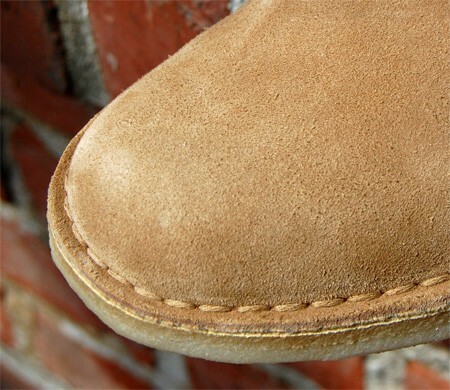 They are comfy, durable, and are guaranteed to look great with a pair of corduroy’s. I would definitely recommend buying a half-size smaller than usual, because as they break in, they will naturally form around your feet. The boots’ simple yet stylish design is what I consider to be the perfect balance between cowboy boots and Bucks. 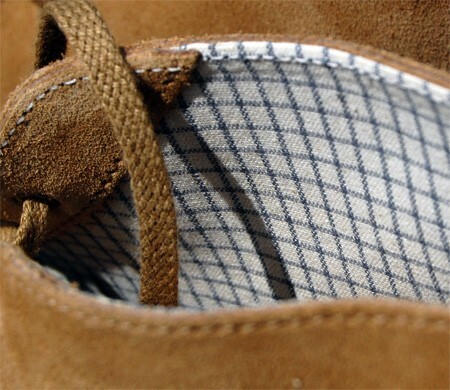 The classic two-eyelet design is not only clean and simple, but also provides for easy tying. Despite popular opinion, I would recommend replacing the traditional Sperry’s, for Clark’s Desert Boots this upcoming spring and summer. It is a unique look, that when combined with a button down plaid shirt and chino shorts, provides for the perfect balance between dress and casual. When trying to pull off this distinctive look, a certain level of confidence is necessary. 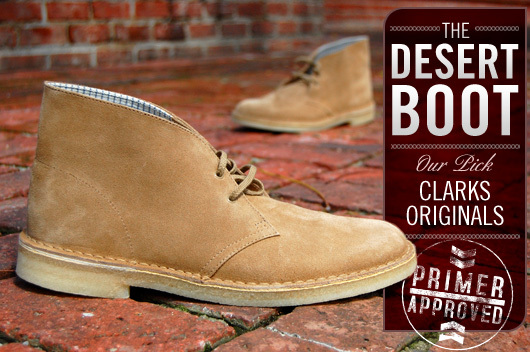 I am proud to strut around in my Clark’s Desert Boots, knowing that I am in my own realm of style. These things never go out of style, they are classic. I remember wearing them to grade school in the early 60’s, then to JR High and High School during my Hippie phase. I’d wear a pair today but now, as an old fart, I have flat feet and need more arch support than they can provide. Andrew, are these boots still considered fashionable? I am a fashion newbie trying to upgrade my style and these look like a good option. But I noticed this post is a few years old…so would you still recommend these as strongly? Or are they out of style now? Still wearing my square toed shoes at the moment…. Definitely still a staple. They’re a solid choice. I have been wearing Timberland Endurance boots for 4 years. Most comfortable and bad environment ready boot I’ve ever owned. I’ve bought Wolverine boots for a long time and decided to give this Timberland PRO Men’s 95567 Endurance Pr 8″ Work boot a try. Well I’m in love and throwing away the rear-view mirror. Timberland just went to the head of the class in my book and trust me I’ve been wearing safety work boots for 35 years in the Power Plant Industry and I finally found a boot comfortable and tough enough to handle what I can do to a pair of boots. Great job Timberland. I’m impressed! I found great and informational reviews about it on http://www.bootzoom.com/ . It is worth every penny . My father has been wearing Timberland Endurance boots for 4 years. He says Most comfortable and bad environment ready boot he has ever owned. he has bought Wolverine boots for a long time and decided to give this Timberland PRO Men’s 95567 Endurance Pr 8″ Work boot a try. Well he is in love and throwing away the rear-view mirror. Timberland just went to the head of the class in his book he finally found a boot comfortable and tough enough to handle what he can do to a pair of boots. Great job Timberland. we are impressed! I found great and informational reviews about it on http://www.bootzoom.com/ . It is worth every penny .